The Basic Method of Meditation by Ajahn Brahmavamso is a guide to getting started with meditation practice. Unlike many of the books here it is for the absolute beginner. Ajahn Brahmavamso writes in the foreword that meditation is the way to achieve letting go: In meditation one lets go of the complex world outside in order to reach the serene world inside. In all types of mysticism, in many traditions, this is known as the path to the pure and powerful mind. The experience of this pure mind, released from the world, is very wonderful and blissful. Often with meditation there will be some hard work at the beginning, but be willing to bear that hard work knowing that it will lead you to experience some very beautiful and meaningful states. They will be well worth the effort! It is a law of nature that without effort one does not make progress. Whether one is a layperson or a monk, without effort one gets nowhere, in meditation or in anything. Effort alone, though, is not sufficient. The effort needs to be skilful. This means directing your energy just at the right places and sustaining it there until its task is completed. Skilful effort neither hinders nor disturbs you, instead it produces the beautiful peace of deep meditation. 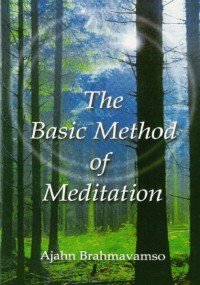 Thank you for uploading this ebook, the Basic Method For Meditation. The world is filled with problems. Meditation is like a golden sword. With one cut, it cuts out all the problems in life. We highly recommend this ebook and your website. You’re doing a great job and we consider you a hero for humanity! God bless! The world is filled with so many types of problems and meditation is like a sharp samurai sword that cuts off all the problems from the roots! Great fullness describes the healing balm this teaching works on one’s life. Thank you again, and-forever.